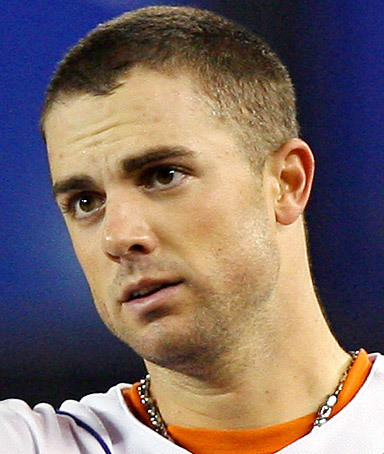 David Wright is the Mets most valuable asset on and off the field. He’s their recognizable star; an upstanding citizen; still a top tier player at a hard-to-fill position; signed long-term to a reasonable contract; a stand-up player and leader in the clubhouse while others have shied from the responsibility. That’s why the Mets should trade him. Don’t think for a second this is akin to Mike Francesa’s tired and self-serving attempt at attention-grabbing after the 2008 season in which he insisted the Mets had to “break up ‘da core”. There is no longer a core to break up. The remnants of the title-contending Mets from 2006-2008 are either gone, aging or preparing for departure. Omar Minaya and Willie Randolph were fired; Oliver Perez and Luis Castillo have been released; Carlos Beltran and Jose Reyes are free agents at the end of the year and will either be traded or allowed to leave; Johan Santana is a forgotten man as he rehabs from shoulder surgery; Carlos Delgado, Jose Valentin, Billy Wagner and Duaner Sanchez are gone and long since forgotten. Since the injuries to teammates mounted in 2009, there’s been a sense of lone man on an island surrounding Wright. As the Mets have collapsed on and off the field, Wright has endured; asserted his desire to stay; played hard and through aches and pains; withstood the unfair vitriol from frustrated fans as the sole remaining target for their abuse—and he’s behaved classily and professionally. There’s no longer a core of anything. This season is degenerating rapidly into a disaster and the Mets most marketable asset is Wright. They could extract a bounty for him. With their current weaknesses, financial situation and season spiraling as it is, they could bring in a large haul for Wright. He’s signed to a reasonable contract through 2013 that pays him $14 million this season; $15 million next season; and a $16 million option for 2013 with a $1 million buyout. He does not have a no-trade clause. He plays a premium, hard-to-fill position and a change-of-scenery to a more friendly home ballpark and surrounded by better players in a more positive atmosphere would return him to MVP contending status. Given these factors, a starting point in any trade talk would have to include a blue-chip pitching prospect; a blue-chip infielder who can hit and run; an innings-eating, relatively young starting pitcher; and another young bat with an attribute—speed or power. Everyone and everything should be on the table. No team should be excluded from soliciting an offer for Wright and that includes the Phillies, Braves, Marlins and Yankees. All have prospects to deal; all could put Wright somewhere; all could fit him into their salary structure at least for the short-term. How would the Phillies—who are going to need a bat—look with Wright at third base bashing in Citizens Bank Park and Placido Polanco moving to second? If and when Chase Utley comes back, they could shift he or Wright to the outfield. The Yankees and Braves also could send him to the outfield; the Marlins are desperate for a third baseman and if they’re in contention, would they include Matt Dominguez to get Wright? They’ve got the nerve to do it. The Dodgers, Angels, Athletics (who were suggested as a possible destination for Wright on Bleacher Report a couple of days ago), Cardinals, Diamondbacks, Padres—all are locations that could use Wright and have the goods to get him. It’s best for both sides. The new Mets baseball operations crew, led by Sandy Alderson, made their name in objective analysis and an absence of fear. The current club circumstances won’t be affected by dealing Wright. Fans aren’t coming to the ballpark; they’re going to lose 90 games with or without Wright; they have multiple needs and financial issues hindering their flexibility; he—as opposed to Beltran, Reyes and Francisco Rodriguez—isn’t carting a load of baggage or impending free agency to dilute the return in a trade. In making a smart, aggressive deal, they could be ready to start anew by opening day 2012 with the Wilpon financial morass (hopefully) settled; a load of money off the books; and a stable of young players with fresh legs, unsullied by the residue of past failures. Wright is 28-years-old and the frustration of losing and drama is wearing on his once-sunny disposition. He’s tired and you can see it. Knowing how things are clearly getting worse before they get better and that his compatriot Reyes—who was meant to be the other half of the dual-cornerstones for years of contention—is heading out the door, makes this an obvious call for everyone. Perception and reality make the time right. Wright isn’t the type to ask for a trade, but then neither was Roy Halladay. Halladay stayed in Toronto as long as he could stand it, but finally asked out. It was one of those rare deals that worked for both sides. The Phillies got a star pitcher still in his prime at a financial discount; the Blue Jays acquired an ace starting pitcher and future Cy Young Award candidate in Kyle Drabek. The Mets aren’t contenders for anything this year aside from a high pick in the 2012 draft—they look terrible; they are terrible. Clinging to the past and hoping that Wright can lead the next wave of young players into viable contention—something that won’t happen until 2013—is a mad shortsightedness in the interests of current perception and is exactly what they’ve tried to get away from with the hiring of Alderson. Keeping Wright is the equivalent of refurbishing a dilapidated house by holding onto a valuable painting hanging on a crumbling wall. It’s pointless when the same painting can be dealt or sold for great value. Rather than patch a defaced and collapsing property, they need to reach the root of the problem. The Mets have to rebuild the foundation entirely. There’s nothing left for Wright with the Mets. It’s diminishing returns if they keep him. They need to start over. And the best way to do that is to trade David Wright. Purchase my book, Paul Lebowitz’s 2011 Baseball Guide. It’s useful all year long and all me, take it or leave it. No fear; no remorse; no apologies. And You Signed Him Why? Yankees GM Brian Cashman might want to consider going back to saying lots of stuff while saying nothing at all. By that I mean speaking in circles, using corporate terminology to answer questions without really answering them in a way that might come back to haunt him. This past off-season, Cashman alienated Derek Jeter during their contract negotiations; made the bizarre decision to pursue Carl Pavano for a return engagement that would’ve been something similar to Chevy Chase getting an opportunity to give The Chevy Chase Show another go; and was overruled by ownership in the signing of Rafael Soriano after he’d said he didn’t want the reliever. One pitcher he did want was Pedro Feliciano. Feliciano was a longtime Mets reliever who was their lefty specialist and acquired the nickname “Perpetual Pedro” because he was used so often. Beginning in 2006, Feliciano appeared in 64, 78, 86, 88 and 92 games. He didn’t throw that many innings—never more than 64 in one season—but factoring in all the appearances and warming up in games where he didn’t pitch and there’s a basis for Cashman’s lament that Feliciano was “abused”. In this ESPN Story, Cashman makes his statement; Mets pitching coach Dan Warthen retorts; and Feliciano speaks out regarding the rotator cuff strain that has placed him on the disabled list. There’s no one who’s obviously “wrong” here, but Cashman appears to be using selective information when discussing the Feliciano injury. Cashman was unaware of the “abuse” that Feliciano had been subjected to? And the excuse for ignoring the “abuse” was that there was a thin market for left-handed specialists and the Yankees needed him? This was why they signed him for 2-years and $8 million? The suggestion that Feliciano was abused implies that he’s damaged goods and is on borrowed time. Wouldn’t common sense dictate that this is a pitcher who should’ve been offered a 1-year deal or avoided entirely? That maybe the Yankees should’ve looked elsewhere for a lefty specialist? Cashman’s timing is a bit out-of-whack for this sudden misplaced blame and buyer’s remorse especially since a week ago, this article about Feliciano was published in the NY Times relating his desire to pitch, pitch and pitch some more and that Feliciano himself said that the current injury has nothing to do with workload. You can craft a bit of a family tree concerning Feliciano and trace it all the way back to the Yankees if you’re looking to assign blame for the situation. The Mets manager from 2006 to mid-2008 was Willie Randolph who, prior to taking the job as Mets manager, was on Joe Torre‘s staff with the Yankees; Randolph ran his bullpen similarly to the way Torre did. Is Cashman conveniently ignoring the wasteland of overused relief pitchers from Torre’s days as his manager? Does the name Scott Proctor ring a bell? Proctor never complained, always took the ball and was blown out by Torre. Other Yankees relievers like Tanyon Sturtze, Steve Karsay and Tom Gordon were battered by Torre as well. Where was Cashman with his protectiveness? To shield them from the horrific “abuse”? How about the fact that the Yankees felt compelled to install the Joba Rules in part to protect Joba Chamberlain from being overused by the reliever-happy Torre; that part of the reason Chamberlain has degenerated into a glorified middle-reliever and failed prospect is due to the dictates, regulations and paranoia for which the Yankees’ GM was the catalyst. Given Cashman’s up-and-down history with pitchers (and I’m being generous), what position is he in to be blaming others for Feliciano’s injury? And if he was so concerned about it, why did he sign him in the first place?